It’s that time of the year when children (and children at heart) go out in their best costumes, knocking on neighbors’ doors with baskets full of candy in hand. It’s that time of the year when candy shops are full of consumers wanting to get their hands on sweet treats. A well-known treat for the fall and Halloween season is the candy apple: whole apples (usually Granny Smith apples) in sticks smothered with chewy caramel and colorful toppings. Never did it occur in any of our minds that such treats would be a source of illness: until now. In January 6, 2015, Bidart Bros., an apple producer from Bakersfield, California, recalled Granny Smith and Gala apples they produced from their facility. The firm did so after an inspection and testing of their facility showed contamination of Listeria monocytogenes. Three clients of Bidart Bros. who are caramel apple manufacturers (Happy Apples, California Snack Foods, & Merb’s Candies) also announced the recall of their products due to L. monocytogenes contamination. The Centers for Disease Control and Prevention worked with the U.S. Food and Drug Association in the investigation of the outbreak. Listeria was isolated from infected individuals, and analysis was conducted through pulsed field gel electrophoresis (PFGE) and whole genome sequencing. These laboratory methods confirmed the presence of the pathogenic L. monocytogenes in the infected individuals. 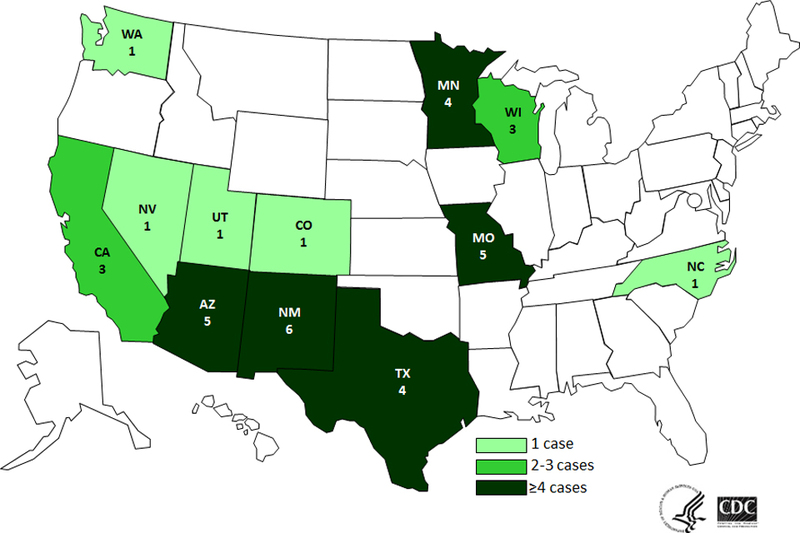 The Listeria contamination caused a multistate outbreak, reaching 12 states across the United States. A total of 35 cases has been reported, with 34 cases causing hospitalization. Based on the report of the Centers for Disease Control and Prevention, 11 illnesses were pregnancy-related, while 3 cases involved meningitis in children (aged 5-15 years old) who consumed the contaminated caramel apples. A total of 7 deaths were reported, with Listeriosis contributing to 3 of those deaths. So how did L. monocytogenes survive and grow in caramel apples, a food in which the pathogen is not expected to grow? At the outset of the Listeria outbreak, many assumed that the cause of growth was the caramel coating on the apples, or the coating process itself. Although testing of the Bidart Bros. apple packing facility revealed the presence of L. monocytogenes on surfaces that directly contacted the apples, further investigation by experts was conducted to understand the mechanisms through which Listeria was able to grow on the caramel apples. Dr. Kathleen Glass, Associate Director of the Food Research Institute in the University of Wisconsin, conducted a study to replicate the process and conditions undergone by the caramel apples during production.Dr. Glass hypothesized that inserting sticks into the apples released juice on the otherwise dry surface of the fruit, and subsequent coating with caramel trapped the pathogenic bacteria inside the finished product. This, in turn, created a favorable environment for L. monocytogenes to grow in the caramel apples. In the experiment, apple samples were inoculated with L. monocytogenes before dipping in caramel. One group contained sticks inserted into the apples while the other group did not have sticks inserted. Experimental results revealed that both groups of stick-punctured caramel apples (refrigerated and non-refrigerated) showed significantly greater L. monocytogenes growth than non-punctured caramel apples. This study indicates that extra precautions need to be taken in processing of such foods, since the interface between different components of the product may provide favorable conditions for growth of pathogenic bacteria. Even though foods are considered to be unfavorable for pathogen survival and growth, food safety measures still need to be taken to prevent future outbreaks. Listeria monocytogenes has an infectious dose of 105 to 107 CFU in high risk individuals (eg. children, pregnant women, older populations, and immuno-compromised individuals). The pathogen is known to have adaptations to survive in the environment. L. monocytogenes is able to grow at refrigeration temperatures, and has the ability to form biofilms, thereby enhancing the pathogen’s survival in the environment. Listeriosis is the bacterial infection caused by the pathogen L. monocytogenes. Symptoms of the disease include diarrhea, fever, muscle aches, confusion, and loss of balance. Severe “invasive” cases of listeriosis may result in bacteremia, septicemia, and meningitis in high risk individuals. How do you think this incident affects the apple industry in Canada? Should we now be extra careful in eating caramel apples? Comment below and share your thoughts! Click on the “Cinnamon Caramel Apple Pumpkin” photo (from Darla of Bakingdom.com) to grab the recipe and have a great Halloween! Andrews, J. (2015). IAFP 2015: Experts May Have Determined How Caramel Apples Caused That Listeria Outbreak. Centers for Disease Control and Prevention. (2015). Multistate Outbreak of Listeriosis Linked to Commercially Produced, Prepackaged Caramel Apples Made from Bidart Bros. Apples. Glass, K.A., Golden, M.C., Wanless, B.J., Bedale, W., & Czuprynski, C. (2015). mBio: Growth of Listeria monocytogenes Within a Caramel-Coated Apple Microenvironment. American Society for Microbiology. Ryser, E.T. & Marth, E.H. (eds.). (2007). Listeria, Listeriosis, and Food Safety (3rd Edition). Boca Raton, Florida: Taylor & Francis. pp 85-110. I like how you incorporated Halloween in your blog! This is a similar topic discussed in lecture on L. Monocytogenes. Especially the idea that a wooden stick puncturing the apples may have been the biggest determinant in Listeria growth. I find it interesting that having that stick punctured in the apple can enhance Listeria’s survival to a degree where it has caused such a negative impact on the population. Super interesting to learn a bit more in detail about something that was mentioned in class! Candy apples are not something people usually consider a risky food to eat so its a bit concerning how much harm this contamination has caused. Although a large chunk of people who were harmed by this contamination were either pregnant or immunocompromised, everyone still needs to be careful about the foods they are eating. I dont think however that the Canadian market will be affected by this outbreak. Most people’s food choices are not that heavily influenced unless an outbreak is occurring close to them or directly affects them in some way. Furthermore, if we became concerned with every food that has been linked to an outbreak or has the potential to be contaminated I think there would be very little food left for us thats safe to eat! It is interesting how one small step in the Candy apple production could cause a food safety issue. Its important as students in the food science field to understand how every person, thing and process in a food plant could be a chance for bacterial contamination. I found it very interesting that the small amount of juice that is expelled during the process when the sticks are pushed into the apples was enough to allow for growth of Listeria on the Candy apples. I do not think this will have much effect on the Candy apple industry in Canada. I do not think a lot of people hear about food recalls outside their country. I think if we tried to avoid all foods that have had outbreaks in the past their would be very little we would eat. I think it is important for the general population to be aware of food safety risks, and the fact that any prepared foods may carry a food safety risk, although in countries like Canada these risks are monitored and should be small. I really liked how you related your post to Halloween! Even though it’s surprising that 35 cases were reported, with most of them resulting in hospitalizations, I also believe that this outbreak won’t have a big effect on the Canadian apple industry, especially since the outbreak didn’t happen in Canada. I believe that the Canadian apple producers and authorities should be worried about how the wooden stick puncturing process can enable L. monocytogenes survival and growth, but I don’t think the general public will be very concerned about this topic. Great article! I think this case is a good example of how well L. monocytogenes can adapt and survive in unexpected places. Hopefully people in the food industry can learn from this outbreak and consider how important food safety practices are even in supposedly low-risk foods. I think this is especially important regarding listeria since it can have such devastating effects in vulnerable populations. In this case it’s disturbing since caramel apples would be particularly attractive to children. Very interesting article! It’s unfortunate that a sweet treat like this, adored by children and adults, can result in an outbreak nightmare like this. I could be wrong, but what I am curious about is how a treat that’s been considered safe for consumption throughout all the years that it’s been available for consumption, is now causing problems in terms of food safety. Could this be an indicator of an increased survivability of the Listeria species? Another point that I’m curious about is the time of consumption and storage in relation to pathogen survival and growth. Since inserting sticks into apples introduces a favourable environment for pathogen growth, and the pathogen requires time to replicate and grow to infectious dose, would consuming the apple product right after production decrease the possibility of infection? And so I wonder, would it be safer for consumers to purchase freshly made caramel apples as opposed to pre-made ones? Overall, I don’t think that this outbreak would negatively influence Canada’s apple industry since this outbreak is specific to the production process of caramel apples. However, I do think that the individuals with higher risk of infection, such as children and pregnant women, should be cautious when consuming such products.